17,500+ This user has made more than 17,500 contributions to Wikipedia. This user has 28 DYK contributions for newly-created or expanded articles. This user helped promote the article Royal Stag to good article status. This user has been on Wikipedia for 4 years, 3 months and 12 days. This user is a member of the Wikipedia Department of Fun. This user is a member of WikiProject Solar System. This user is from the planet Earth. This user is interested in astronomy. This user is interested in space exploration. This user is a member of WikiProject Spirits. This user is a member of WikiProject Religion. This user is a member of WikiProject Pakistan. This user is a member of WikiProject Sri Lanka. This user is not a Wikipedia administrator, but might like to be one someday. Hi, I'm Human3015. I have 2 alternative accounts named HumanAyesha and HumanManda which I created to use it on public internet network. Gurudongmar Lake, Sikkim, India. See also:Tourism in North East India. Another great Mughal architecture Bibi Ka Maqbara in Aurangabad, Maharashtra which look like Taj Mahal. See also:Tourism in Marathwada. 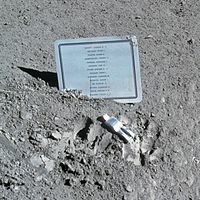 Fallen Astronaut Memorial at Moon. It is the only "art piece" on the Moon. See also: Tourism on the Moon. Ranikot Fort, Jamshoro District, Pakistan. One of largest fort in the World. See also: Tourism in Sindh. Somapura Mahavihara is a World Heritage Site in Naogaon District, Bangladesh is a well known Buddhist Vihar. See also: Tourism in Bangladesh. Laas Geel rock art sites in Somalia, some sites are more than 10,000 years old. See also: Tourism in Somalia. Barack Obama visiting Cape Coast Castle in Ghana. See also: Tourism in Ghana. Botanical Garden of Curitiba in Curitiba, Brazil. See also: Tourism in Brazil. National Museum of Cambodia. See also: Tourism in Cambodia. Livadia Palace, Yalta, Ukraine. See also: Tourism in Ukraine. You can have great tour to our Universe by using following templates.